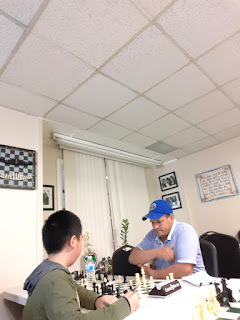 which is now located at 75 East Cherry Street, Suite 11 in Rahway, N.J.
National masters Jim West and Mauricio Camejo [pictured right, playing against Timothy Xie] tied for first place in yesterday's quad. 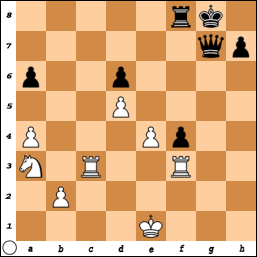 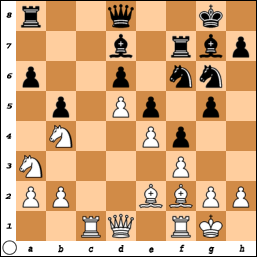 39.Nc4 Qe7 40.Nd2 Qh4+ 41.Ke2 Qg4 42.Kd3 a5 43.Kc2 Rc8 44.Kb3 Rb8+ 45.Ka3 Re8, draw. 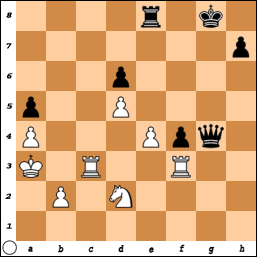 Updated Sat. 7/14 @ 6:41 p.m.
21 Saturday Quads (G/45 d5) 10:30 a.m.
11 Saturday Quads (G/45 d5) 10:30 a.m.
18 Saturday Quads (G/45 d5) 10:30 a.m.
25 Saturday Quads (G/45 d5) 10:30 a.m.
For information about the above events, lessons, summer camps & our chess school please contact Arthur at chessmates@chessmatesnj.com, or 760-583-8429.